Fabricated City is the first Korean movie that I watched in 2017 and I was not disappointed! The 2017 action crime film, rated NC16, is directed by Park Kwang-hyun and starring Ji Chang-wook (지창욱) and Shim Eun-kyung (심은경), has kept me glued to my seat for the whole two (2) hours without feeling tired reading the English & Chinese subtitles off the big-screen. Without giving the spoiler away, this is a Cyber crime themed action movie that involved murder, fraud and identity theft and it has all the elements of laughter, tears, anxiety and awe packed into one. I must admit I really enjoyed watching "the fearsome" mobster played by Kim Sang-ho (김상호) because his every move was so comical. The unspoken affection displayed between Kwon Yoo and "Mr. Hairy", played by Ji Chang-wook and Shim Eun-kyung respectively, did give me goose bumps. 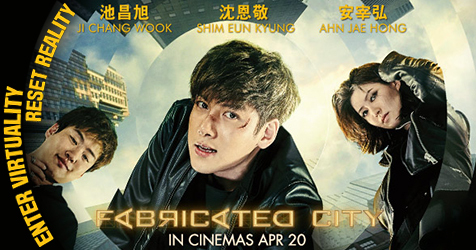 Fabricated City does has its exaggerated moments like all action films and coincidentally one of which is very similar to the recent Hollywood blockbuster - Fast And Furious 8 - which also opened the same week as Fabricated City. Both movies touched on how security breach could allow hacker to take control of cars and turned them into murder weapon. After watching "Fabricated City", it actually has given me a wake-up call to the digital footprint that I am leaving behind while I'm online - such as sign-in to GRAB website using my Facebook or Google account, etc. - that one day such information could be used against me (or my loved one) due to a cyber-attack somewhere where my information was resided. While governments like Singapore is promoting smart nation as a national effort for Singaporeans, businesses and government to support better living using technology, by having smarter ideas, apps, etc, have you considered the danger that it might pose when the security of your digital space has compromised? Granted, security breach is so common nowadays that entering an unsecured website or reading an email by an unknown sender could lead to your sensitive, protected or confidential data copied, transmitted, viewed, stolen or even used by an unauthorized individual. Nevertheless, solemnity aside, Fabricated City is a movie certainly worth every dollar of mine! Whether you are watching because of Ji Chang-wook (지창욱) or just for pure entertainment value, do catch this Korean crime-action movie with English & Chinese subtitles at the nearest Cinema / Theatres near you today!